AllergyEats, the leading guide to allergy-friendly restaurants nationwide, has just released its 2016 list of the Top 10 Most Allergy-Friendly Restaurant Chains in the United States. The chains on this prestigious list hold the highest ratings on the AllergyEats app and website, per feedback from the food allergy community. AllergyEats restaurant ratings are based solely on how well restaurants have accommodated food-allergic diners, and not on other factors, such as ambiance, service or food quality. The Most Allergy-Friendly Restaurant Chains are grouped into two categories – large (50 or more restaurants) and small (under 50 restaurants). Results were based on diner feedback from the AllergyEats app and website through December 31, 2015. Some of the restaurant chains on the 2016 list, including Red Robin Gourmet Burgers, P.F. 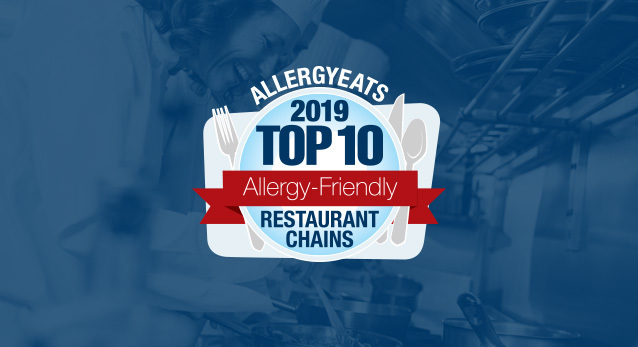 Chang’s China Bistro, and Legal Sea Foods, have earned placement on the AllergyEats Most Allergy-Friendly Chains List consistently for several years. Rainforest Café is new to the list this year, and is being recognized for their willingness and ability to expertly accommodate food-allergic guests. 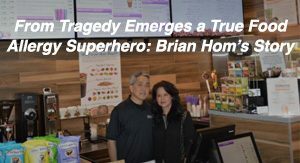 “The AllergyEats Top 10 Most Allergy-Friendly Restaurant Chains list – and the growing number of AllergyEats ratings of all restaurants – helps the food allergy community make more informed decisions about which restaurants to visit and which to avoid, based on how well or poorly they’ve accommodated other diners’ food allergies,” Antico explained. AllergyEats (www.AllergyEats.com) is a free, peer-based app and website where people find and rate restaurants based solely on their ability to accommodate food allergies. AllergyEats lists more than 850,000 restaurants nationwide, which people can rate, and also offers user comments, web links, menus, directions and more. Restaurants are easily searchable by geographic location, so people can find allergy-friendly establishments around town and around the country. 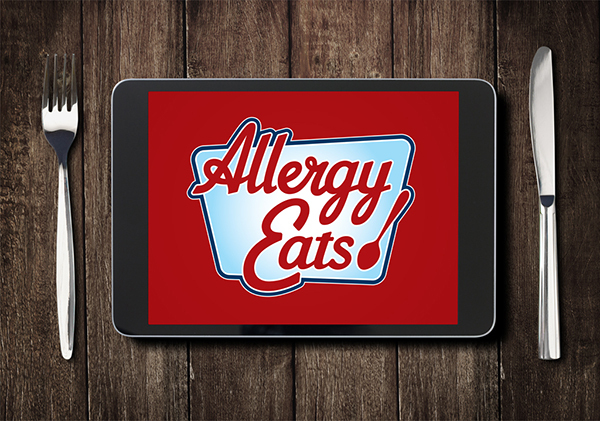 The app, website, and related social media forums help families with food allergies reduce the guesswork and the anxiety surrounding dining out with food allergies. I am extremely sensitive to soybean. The only thing I can have at Red Robin is their Natural Hamburger on a GF bun or lettuce wrap. Everything else is prepared or has soy in it. Even their Red Robin Seasoning does. I can, also, have their broccoli. We love Legal Seafood. Always has been a great experience for us. Our goal to for special occasions. I can’t bring us to try PF Changs. The risk of Asian food for nuts seems too high. I love Asian food! I know it’s me and my anxiety. P.F. CHANGS is excellent. Loyal fan. Last time I ate at Legal Seafood I got violently ill!!! Mellow Mushroom used to be a fav here but recently we visited and I inquired about their pesto pizzas and they told me the pesto is nut based and frequently gets all over the pizza stones but they scrape them at the end of the evening. They cannot guarantee no cc for TN. So we do not eat there anymore. Love Maggiano’s! Every time I am there they come to my table and make sure they know what my allergies are and they make sure to make it so I can eat it! My son left Mellow Mushroom in an ambulance and spent the night in PICU because Mellow Mushroom served him a regular crust after we had clearly communicated his wheat allergy and requested a GF crust. I wrote the company encouraging review and improvement of their training practices regarding allergy/special diet accommodations and never received a response. Shame on them and beware to anyone who feels confident eating there just because they made this list. What about Cheesecake Factory? They are great. My understanding is they cook the food in stations so all the fish is cooked in one area of the kitchen for example. My son is highly allergic to peanuts and has to avoid all nut and legumes especially soy. Soy is hard as it is in everything. They are always great to us. Just can’t eat the desserts as they are made at a central bakery. My daughter has eaten at some of the restaurants on this list. I have found that just because a chain makes it on the list, does not mean that every restaurant within the chain is allergy friendly. And since the staff is different at each location, dining experiences are different. We try to write down the server’s name if they are exceptional and ask for that person on return visits. Sometimes it works, sometimes not. It’s unfortunate that so many restaurants here in the U.S. are not more accommodating when it comes to food allergies. We vacationed in Stockholm, Sweden last year and our dining experiences were exceptional. Every single restaurant we ate at were extremely accommodating and my daughter was thrilled (peanuts, tree nuts, eggs & dairy allergies). At one point I asked a server how was it that all the restaurants were so allergy friendly and the response was “some of our customers have allergies; we need to be able to feed them, too.” Imagine that!! Maggiano’s is unbelievably careful of allergies and kind to their customers about it. I’ve seen their staff accommodate special cases with so much grace, I found myself wishing every restaurant would send their staff to Maggiano’s for training. Every time we go to Atlanta, we dine there; the food is extremely good, reasonably priced, and the staff are incredible. I was surprised to see Red Robin on the list. It has been about six years since I last ate there. They brought me a printout of foods I could have, which at the time was a side salad. When a group of friends were going to PF Chang’s, they called ahead to see if they could accommodate my peanut allergy. They suggested that I not come. Perhaps I should give them both another chance. If the restaurant has your allergy and you are anaphylactic-buyer beware. No matter how “allergy friendly” a restaurant appears to be for someone else it still requires it to pass your level of comfort. Call first and talk to the manager and chef. I would never go to most of these restaurants basically because I have seen accidents noted online. There is always potential of “traces” mishandling or even the wrong sauce being brought to the table (these have all happened to us). PF Changs would be the most dangerous as my daughter is also airborne and contact reactive to peanut protein. Just eating food cooked and prepped in the same kitchen and oven with peanut dishes would be more risk than we can afford. Also dishwashing is never perfect in these places and someone sitting behind her enjoying their food could totally unexpectedly do her in. Please do your own investigating before you take any chances. It would be beyond fantastic if they started identifying things that contain sesame, even better, if they were required to list All ingredients in all foods. It’s not been my daughter’s Tree Nut or Peanut allergies that have been the main danger that’s prevented my daughter from being able to eat at restaurants or consume premade foods for 18 years, it’s her Sesame allergy. Hello all. Paul here from AllergyEats. I want to make a few general comments here for the many tens of thousands of people who are reading this. 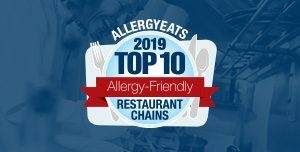 The release of the AllergyEats Top 10 Allergy-Friendly Chains in America List always generates some controversy each year – and that is to be expected. While the list is extraordinarily popular and is extremely well-received by most, it by no means suggests that all – or any, for that matter – of these restaurant chains is “allergy safe.” Simply put, there’s no such thing. We see a lot of comments above, and plenty online, criticizing chains that have made the list based on the commenters bad experiences – and we believe those experiences are real and just. And that’s exactly why we have AllergyEats! Even the best restaurants and chains are not perfect – too many factors come into play – but through the ratings of the vast food allergy community on AllergyEats, we can get a very accurate sense of which restaurants and chains “get it” and can accommodate our community better than others. It’s called the “wisdom of the crowds” and we believe in it much more than any one experience of mine or any “expert.” We aggregate all that data – all those good and bad experiences at all kinds of restaurants – to present you the AllergyEats ratings and this list of the Top 10 Chains. 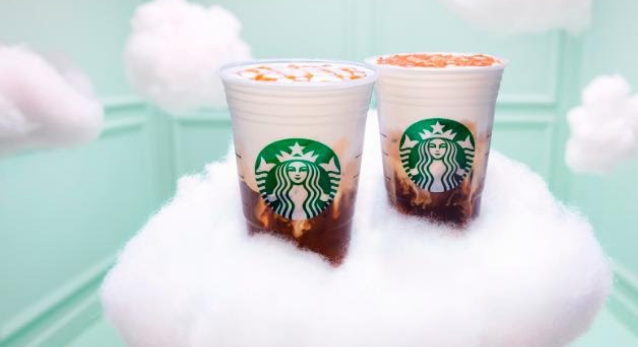 The other criticism this list generates each year is based on the breadth of type of restaurant, specifically their reliance on particular allergens – Asian (peanut, soy), Seafood (fish, shellfish), Italian (wheat), Burgers (dairy, sesame), etc. Yet again, these restaurant chains are “voted on” by members of the food allergy community with up to 200+ allergies every year. 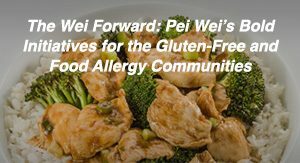 Some people have mistakenly tried to make of this by saying that AllergyEats is dominated by people with peanut allergies or gluten intolerance, but that simply isn’t the case. AllergyEats’ users and raters cover the gamut of allergies, roughly in proportion with the general community, and with a pretty even distribution of the 5 most common allergens. What that says to me – and I have considered this a truism since I’ve gotten to know many restaurant personnel over the years – is that being “allergy-friendly” is NOT about the menu (though that helps in some cases), but about the COMMITMENT of the owner or management or a restaurant or chain. That is why, for example, Legal Sea Foods is rated 4.5 for those with shellfish allergies (and even higher for those with fish)! I’ve personally sent fish-allergic individuals to Legals, confident in their abilities. And in at least one case where the family realized they had a Legals close to home, it became their go-to restaurant… with their fish-allergic daughter. The same can be said across the board. While the experiences won’t be universally positive (none of these chains has a 5.0 rating), these chains all have great training methodologies or programs, great procedures and protocols for avoiding cross-contact, great communications plans for making sure allergies are well understood from the front of the house to the back (and back again), and will do their best to accommodate those in our food allergy community. So please continue to share your comments here – positive, negative, and otherwise – but more importantly, I strongly urge every person who reads this, and everyone else touched by food allergies, to rate every one of their restaurant experiences on AllergyEats – chains and independents, fast food to fine dining, good experiences and bad, etc. The more ratings everyone leaves, the more valuable AllergyEats becomes for all of us… and the more precision we can have in bringing you future Top 10 Chains lists and more! Thank you for reading this, thank you for your comments, thank you for your participation in AllergyEats, and happy (and safe) eating!!! I have a life threatening allergy to latex and cannot eat food handled by latex gloves. I have an extremely hard time eating out because many chain restaurants serve foods prepared offsite and just heated onsite. Managers will often offer to have staff wash their hands and prepare my food, but if latex gloves have been used in the facility, there are latex particles that have been released into the environment. Also, many staff do not know the difference between nitryl and latex gloves so they say they use latex gloves but when I ask to see the box, it actually is nitryl or vinyl gloves. I wish more attention would be paid to latex allergies. I have dined at Cheesecake Factory and despite having items I am not able to consume the dishes I can eat are delicious (soy allergy–sometimes airborne: smells of Asian food, mostly topically and injested + sensitivity to MSG). Red Robin has caused me to need my benadryl because unless you berate them into NOT putting their soy-based, msg filled seasoning on everything you’re out on your own. Bahama Breeze is also amazing for being a plus on the allergy concerned scale! If you have a soy allergy do yourself a favor and also find out what kind of Oil they use –they can say its olive oil but there are blends of 90/10 oil and its 90% soybean oil and 10% olive oil. Do your due diligence and always call first! Rainforest Cafe should.not be in this list. We went through all the necessary steps when ordering and the chef even personally came out and claimed to have double checked and said that his order contained no dairy. WRONG! He never checked. One bite and my son knew. The next 24 hours were a nightmare! I will never go there again! I walked and told them we were not paying for the meal. Maggiano’s is amazing in Milwaukee, WI and Chicago, IL for nut allergies! My son had an anaphylactic reaction after eating at P.F. Changs. He is allergic to eggs and all seafood, but after speaking with the manager I felt confident that his meal could be prepared without cross contamination. Turns out that all of the meats are pre-marinated in egg. I spoke with the chef the day after the incident, and he assured me that he used “clean” chicken. My gut feeling is that maybe they washed the egg off the chicken, but I will never know. Years later when I went back to try the restaurant again, the manager said the only egg-free meats are frozen. My son’s only option was to eat all vegetables, and that was not appealing to him so we left. I believe they could safely accommodate his seafood allergy, but not his egg allergy. Chipotle has been great for us and we go there all the time! Can’t wait to try Maggianos! LuLu’s in Gulf Shores, AL and now Destin, FL should be given high marks for taking care of diners with allergies. They have separate menus for various allergies and send the kitchen manager to your table to take your order and deliver your food once it’s prepared. I have problems with gluten and have never had a reaction after eating at LuLu’s. I am so very disappointed with Allergic Living magazine. 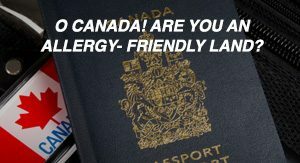 On Allergic Living’s website they state that Boston Pizza is an Allergy Friendly Restaurant, but its not. They put my son’s life at risk, and when I contacted ALLERGIC LIVING IGNORED ME FOR MONTHS! The only person I am allowed to speak to is Courtney, and she doesn’t handle anything. I was told I needed to speak to Jason, but Courtney says there is no phone number for him and even though I have left messages for him to call me he doesn’t call me back. So who can I speak to? The only response I got was an email from “Editor” and they praised Boston Pizza for all that they did for us!!! I think they must be from another planet. I explained to Courtney that we have eaten there about 6 times and was NEVER told about the risk of cross contamination of all deep fried foods. Every time we went there, waitresses brought us the Allergen Book and we all looked it over together and saw that the foods we ordered were free from peanuts and peanut cross contamination. However, our last visit the cook wanted to bring to our attention that all foods deep fried are cooked in the same oil as everything else, including nut products. So, why weren’t we told that on our previous visits??? I asked to speak to the manager and told her that the Allergy Information is wrong. We have always been told that the food we picked from the Allergy Book were safe when they actually are NOT! I have to ask anyone reading this: How would you react to finding out that the Allergy Book says Calamari is Peanut Free, but then Boston Pizza deep fries it in the same oil as nut products??? The manager Amanda at the Boston Pizza in Keswick Ontario argued with me that the Allergy Information is correct, because when the food arrives it is peanut free, it only becomes cross contaminated once it is deep fried. Does this alarm anyone here??? Why would Allergic Living ignore me for months? Why would they protect Boston Pizza? Oh, and btw, BP says they always offer peanut free options at no extra charge: Not True. Most often they do NOT have a peanut free dessert for the kids, and when they do, they charge me extra for it. Chipotle is not truly friendly. They use common prep and assembly areas that are cross contaminated. The Red Robin in my city has a separate gluten-free prep area. These are NOT allergy friendly! Never been to PF Chang’s, but I’ve never eaten at Chipolte due to their use of latex gloves when making food (I’m allergic to latex as well as have food allergies. It says on the website of “Mellow Mushroom” that they make their “Enlightened Spinach Salad” with pecans, so it’s NOT allergy-friendly when it comes to nuts. I do think attention needs to be paid to BOTH food allergies and latex allergies. I have no idea why PF Chang’s is highly rated. We went because I saw it on this list. My son is allergic to egg, and apparently ALL their meat is marinated in an egg-wash. The only foods they could offer my 6 year old son was white rice and steamed vegetables. Seriously? They couldn’t make anything else – not even a piece of plain unmarinated chicken. Afterwards, I read another review on this website from someone with milk allergies and they were told at a PF Chang’s that all their meats were marinated in whey. Apparently their solution to dealing with food allergies is to tell you that you can’t eat any of their food except rice and steamed vegetables. They do NOT deserve to be considered a “Most Allergy Friendly Chain”! I agree. Pf changs should not be on the list. They marinade their meat in egg, there is sesame oil in LOTS of things, and Asian food always has nuts. Chipotle is an old standby for me. The fact that you can see what is going in your food makes me feel safer. I totally agree with the previous comments. PF Changs does not belong on this list!! We eat out a lot and PF Changs is one of the least allergy friendly restaurants I have ever encountered!! The only thing they can offer my son is rice!!! Seriously?? Please remove them from your list!! I think Ted’s Montana Grill should be on here. They are the only restaurant that has gone above and beyond when it came to my dairy allergy. I just said ‘no cheese’ on a salad and the waiter inquired if the croutons were ok since they had butter. I’ve never had that experience anywhere else! Someone recommended Cheesecake factory. If youre child has peanut, wheat or dairy allergy please don’t go. Cross contamination from cooking or foid spilling on tables not properly cleaned are a major issue! They serve bread at every table as well. Magianno’s should probably be removed as well. They had only 1 option for gluten and dairy free that was TRULY underwhelming and not flavorful. My son had an anaphylactic reaction after eating at Maggiano’s. We were in the emergency room and his airway started to close up. It definitely should not be on the list. We went to PF Chang in Palo Alto, told them to not have peanuts in the noodles, they served a noodle plate with peanut fragments, we had to take our son to ER and wasted 4 hours. I am really surprised they make this list for being so careless about allergen. I do not think Chipolte, should be on this list. I almost died after eating a tiny chip with salsa. In seconds my tongue swelled drove my self to rose hospital. Had a serious reaction which was almost inabated and my blood pressure dropped. I am highly allergic to peanuts and all other nuts and nut oils. That being said I don’t know if their salsa has peanuts, but one bite and almost died. Tongue swelled instantly to the point my speech changed. PF Changs is horrible about allergy accommodations. I went on 3 separate occasions and always mentioned my shell fish allergy and was assured every time that it had not been contaminated yet every time I left I had gotten sick. Turns out on the 4th time I went, a waiter finally brought me an allergy free menu and it turns out that sesame chicken is cooked with oyster sauce! Not once before was I offered an allergen free menu or ever told that oyster sauce was used in sesame chicken. I have not gone back since and don’t plan to. Chipotle is a no-go. The cheese gets over everything and the guac gave me a mild reaction. Too much cross contamination. Cheesecake factory was phenomenal with my allergies. I’m allergic to dairy, eggs, peanuts , tree-nuts, and mustard. RED ROBIN should be taken off period. THEY HAVE SOY PROTEIN in everything – ESPECIALLY their seasoning that is on EVERYTHING. This will kill people allergic to soy. No restaurant that douses their food in one of the top allergens should be on this list! My daughter has a pork and Dairy allergy (dairy protein, not lactose). Outback has always been amazing for us. They have always been extremely accommodating. Beware, their BBQ sauce has dairy in it, our server actually warned us about it. But it is one of the easiest places for us to go. chipotle too. We were recently at PF Changs in Beachwood, OH. Our daughter gave the server the regular request that she needed the kitchen to be aware that she has a peanut/tree nut allergy. She also went on to say she orders the same menu item each time she eats at PF Changs. It is a peanut/tree nut free choice. After eating a few bites, she picked a peanut out of her food. I want to add that she is 30 years old and this is the first time an actual peanut has ever been in her food. Seeing this was beyond upsetting. She realized that her entire dish was contaminated. She also began to feel the onset of an anaphylactic reaction. We rushed to the hospital (luckily, it was very close by) The ER began treatment immediately. She is still on medications to prevent a possible recurrence. The trauma of this huge mistake goes way beyond the immediate danger. We had a false sense of confidence in this restaurant due to the focus they present of being food allergy friendly. THIS SHOULD NOT EVER HAPPEN!!! I would caution those with food allergies to avoid eating at PF Changs. PF Changs is definitely NOT shellfish allergy friendly. While traveling this summer we stopped at one to eat. One of our party has to be gluten free. She could be accommodated. I have shellfish allergies and the only thing they could offer me was dessert. All of their food has oyster sauce in it, so I had NO options for an entree.